At 8:30 a.m. this morning, a Long Island Railroad train derailed at Atlantic Terminal in Brooklyn. 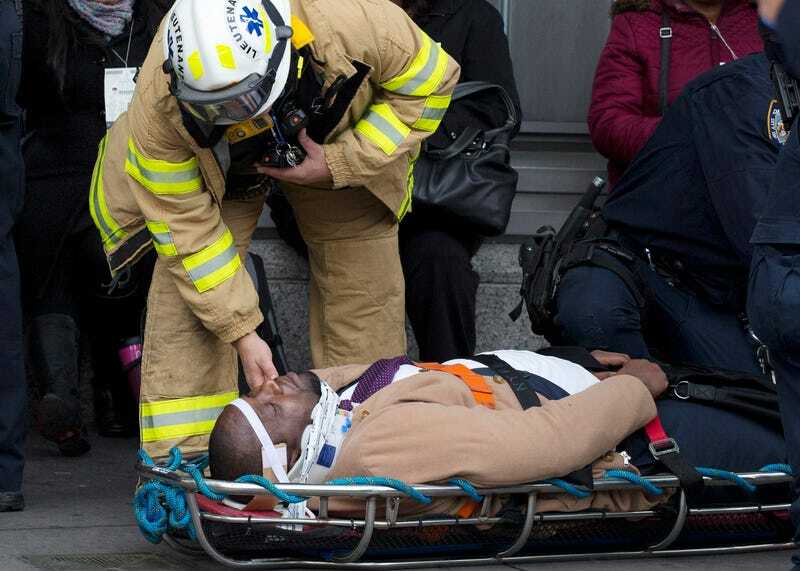 One hundred and six suffered non-life-threatening injuries, reports the New York Times. The train supposedly derailed at Track 6, where it didn’t stop at the end of the platform, writes Gothamist, which sites a bystander. The cause of the derailment remains unclear. The NYPD Special Ops tweeted photos of traffic delays on the roads outside of Atlantic Terminal. The first car on the train derailed, an employee of the Metropolitan Transportation Authority who was at the scene said. The Long Island Rail Road is part of the authority. The employee, who was not authorized to speak about an ongoing investigation and declined to be identified, said the train had come into the station and went past the area where it would normally stop. It hit the bumping block, a barrier meant to stop a train in an emergency. The employee said the impact with the block lifted the first car up off the rails. Update 2:36 p.m.: Thomas F. Prendergast, chairman of the MTA, told the New York Times that the train’s operator was in charge of stopping the train in the station. There weren’t any other mechanisms aboard it to keep it from hitting the bumping block at the end of the track. It is unclear what happened with the operator, but the NYT notes that he or she was being interviewed. The train’s two front cars were knocked off the tracks in the crash. It was traveling from Far Rockaway, Queens.